How will YOU Watch Star Wars: The Force Awakens? Are You a “Goldilocks” in the Theater? Emotions will be at all ends of the spectrum when Star Wars: The Force Awakens hits theaters in December! One month from today, Star Wars: The Force Awakens will be officially released in theaters across the United States. From IMAX theaters and multiplexes, with stadium seating, premium sound, and perhaps even reserved seating; to charming, historical neighborhood theaters with old-fashioned flat seating, Star Wars will once again be gracing the cinematic stage. Where will you be seeing this newest addition to the saga? Have you purchased your tickets yet? Will you wait in line outside, eagerly awaiting your turn to enter the theater? Will you need to? Perhaps more importantly, where will you be sitting, once you’re inside? The idea for this blog entry came from an article I read in my local newspaper about “The Goldilocks Syndrome” of choosing theater seats. Even with the advent of reserved seating now being offered in many theaters (my first encounter being when I saw Ant Man this past August), we all have our ‘just right’ place to sit and enjoy a movie. What surprised me about this seemingly simple task, is how much research is on the Internet about the psychology of theater seating. One article claimed that the choice depended upon the “psychophysics” of the room. Most of us tend to choose seats toward the right side of the theater, in order to optimize right-brain recognition of faces and other visual stimuli (1). Another article entertained the idea of personality type being a predictor of seat choice. Psychologist Hiromi Mizuki claims, for example, that if you choose a seat in the center and front, you are confident and decisive. By contrast, choosing a seat in a back corner suggests that you may be an unconfident onlooker: someone who wants to know what’s going on, but doesn’t want to be directly involved in a situation (2). I try to sit in the middle section, closest to an aisle. Not too far up front, because I get sick if I’m too close to the screen, especially in 3D. Also, my neck gets to hurting from leaning back, and I don’t feel like there’s a good, panoramic view of the screen. The middle section is usually the best area for sound quality as well. Close to an aisle is always a good thing. You know, in case one needs to use the facilities. I’m pretty much a stone bladder if I’m watching a movie in the theater, especially for the first go-around, but there’s always that chance. If there’s a stadium-style theater with that one row just before the front section — the row with the metal bar to rest my feet on — perfect! One thing that can be challenging, especially with a huge premiere like The Force Awakens, is to sit away from ‘that person.’ You know, the one on their phone, the one who can’t seem to NOT make comments every two seconds, who laughs at the wrong times, and who (goodness forbid, but I’ve witnessed it) falls asleep and snores during the film. Now, granted, it may be difficult to disseminate that before the movie starts, but I can usually predict who that person (or persons) might be during the course of the previews and trailers. I’m not beyond moving myself. Once, I even turned around to two women behind me, who were incessantly chatting at a high volume during the overture and opening scenes of a movie. I simply said: “Are you going to talk the whole time? I’m just asking. Because if you are, no problem, but I’m going to move.” They shut up. I was happy. Like all of you reading this right now, I’m SO looking forward to seeing this first installment of the Star Wars saga, once again gracing the silver screen…and my heart. I do have my tickets, and I will be fortunate enough to be able to see The Force Awakens in a relatively small theater facility, in a small enough town that there won’t be crazy droves of people through which to navigate. I have my tickets, and will arrive with two of my best friends in a timely enough manner, so we can Goldilocks our way to the perfect seats, Junior Mints in hand…very important. How about you? What are your plans for choosing the perfect seat in which to witness Star Wars: The Force Awakens for the first time? How about the tenth time? Next article Introducing the All-New Star Wars Jedi Master Magazine! Unfortunately, my date is not going to be able to join me on December 17th. I am going with a good friend of mine and a fellow Fangirl. We have great seats. I’ll be dressing up for the premiere. Oh. You know. I’ll be … with you and Erica. lol. And I can’t wait. 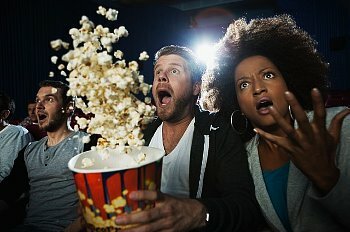 You didn’t mention POPCORN??!! Not that I’m ever going to complain about JMints (yummmmm), but Jay. Come on. Popcorn… POPCORN! I’ll just be happy to be in the theater! I can’t believe it’s only a month away! Wooo-hoooo! I hope you have an awesome time every time you see TFA! Say hello to your cohorts for me. It’s been far too long since I’ve seen you all. By the way, Jay, I recall similar articles/studies about seat choice as it pertained to classrooms where teachers/professors allow students to sit wherever they like. (As a teacher, I bet you’re aware of this! 🙂 ) Studies that go back to the Dark Ages 😉 of when I was in school. (lol) The study results stipulated the same points as those to which you referred. I must admit that I think they ring truer in a classroom situation rather than in a movie theater. I know people who will take into account where the speakers are positioned on the walls — both for optimum listening, and those who don’t want the sounds emanating from the speakers pulsating through their bodies. (I’m all for great sound, but some sound systems are waaaaaaaaaaaay too loud. What kind of damage is done to our sensitive eardrums? Now, that’s a study worth conducting!) I know one individual who prefers a more central location, but always will sit on the aisle just because she KNOWS she will have to get up at some point to use the bathroom. Do you assign seats in your classroom? (I know it can make it easier on a teacher to learn her/his students’ names. . .) If you allow your students to choose their own seats, do you notice any personality traits of those who will sit at the front (yes, I do equate those students with confidence) compared to those who choose a seat toward the back (they’re usually more quiet, and don’t like to participate, in my opinion)? Just curious.